How do you convert your car to run on mushed-up seaweed? It’s not something your average man in the street is wondering, but fortunately some intrepid American fuel-pioneers are. Fed up with the oil industry and pollutant effects of burning petrol, Josh Tickell had been experimenting with biofuels and successfully converted a car to run on waste cooking oil. After concerns that using plant oil created food shortages, they turned their attention to algae. And they reckon that biodiesel created by algae is the answer to the fuel crisis. Well that’d be nice. In a mini documentary on ViceTV, America’s alternative fuel guy shows how you can convert your car to run on alternative fuel. Adding a battery-pack in the boot seems to be the first step, though getting hold of algae gasoline seems to be trickier. Though a group called Solazyme are growing giant vats of algae in the Midwestern desert with an eye to creating biofuel, it’s not exactly widely available. Apparently you can condense the oil-making process from 150million years to 3 days. Excellent. We have spent over $2.2 billion dollars on algae research for the last 35 years and nothing to show for it. 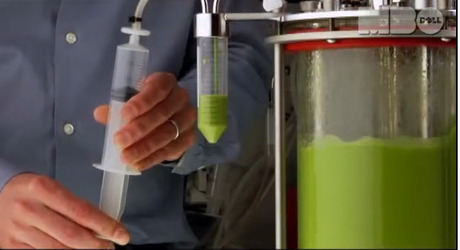 Algae has been researched to death at universities for the last 50 years in the US. The problem is as long as the algae researchers can say we are 3-5 years away, its too expensive and they need more research they get the grant money. Nothing will ever get commercialized and we will not get off foreign oil.